Your roof is an investment, and like any investment, you want to do what you can to protect its value. You wouldn’t neglect your car, would you? Proper maintenance of your commercial/flat roof is important because it helps to address small problems early and eliminate the risk of larger, more costly repairs later. Manufacturer warranties will require that annual maintenance is performed and American Roofing can work with you to design a plan that will help extend the life of your roof. American Roofing, Inc. is a family-owned, Leavenworth-based General Roofing Contractor, incorporated in 1973 in the State of Kansas. We specialize in commercial roofing projects for new construction and re-roofing in the Kansas City Metropolitan area. We have a proven history of completing challenging projects with quality craftsmanship on schedule. American Roofing’s service department has highly skilled roofers that are knowledgeable in all types of commercial roofing. They handle all leak repairs and tasks, such as maintenance inspections, curb installations, and any other roof penetrations. We also offer 24- hour emergency service. Please contact us for an assessment or to schedule service. In the 60’s and into the early 70’s American Roofing’s owner Mike Greenamyre and head estimator Tom Roemer had worked at Mike's father's roofing company in Leavenworth over summer breaks from school. In these times, the hot asphalt Built-Up Roof (BUR) was king. Flat roof systems were called built-up roofs because in fact, they were built up with layers of roofing felt, set into saturated mappings of 420° to 500° hot asphalt. Built-up roofs are still being used today but materials have modernized significantly. Rag and wood pulp felt paper has been replaced with fiberglass and polyester membranes. Asphalt has been seriously upgraded with blends of rubber and modern polymers. Another type of BUR is the Cold asphalt “BURmastic” roofing systems were introduced by Tremco in 1977. Cold asphalt began to be a popular choice for sensitive jobs such as hospitals and schools because it eliminated the smoke and odors normally associated with hot BUR’s. Today's BUR’s have evolved like the car. Auto’s that might have lasted 50,000 miles now last 200,000, and a 15-20 year roof now can last 50 or even 60 years with minimal maintenance. 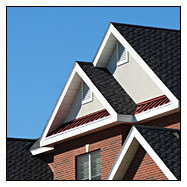 American Roofing’s extensive knowledge and over 40 years of experience with all BUR’s speaks for itself. In most instances, a good built up roof consisted of one ply of a heavy base felt followed by three to four plies of a lighter weight felt, all bonded together with saturated hot asphalt to form a thick waterproof membrane approximately 1/4" to 3/8" thick. 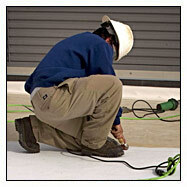 These membranes could be installed over a dry felt nailed to a wooden deck or a rigid wood fiber insulation board. The best finish for the surface was a top pouring of hot asphalt and roofing gravel. When the asphalt cooled the gravel was embedded in place and protected the roof membrane from ultra violet rays, foot traffic and most importantly, hail. In the early 70's, a highly successful single ply roof membrane hit the roofing market and BUR met some high tech competition. Its name is EPDM or more commonly called a rubber roof. 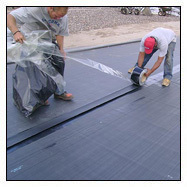 EPDM is a rubber membrane whose principal components consist of Ethylene and Propylene. A flexible rubber matrix forms when a small amount of Diene is added to the mix. At first EPDM membranes were used as pond liners, but it didn't take long before the roofing industry saw its value and created a high tech, high quality roof membrane. American Roofing has installed hundreds of acres of EPDM roof membranes from fully adhered, mechanically attached to ballasted (loose rock) EPDM roof systems. The principle advantages to EPDM are that it is lightweight, unaffected by standing water and surpass the test of time for superior longevity. There is also very little odor and mess, which is appealing to building owners and occupants. In the late 90’s, a new rubber product called TPO or Thermaplastic Olefin was perfected, giving all the single ply rubber benefits listed above and carried a white colored membrane, giving the extra benefit to occupants of reduced cooling cost in the hot summer months. In particular, American Roofing prefers Firestone roofing EPDM, insulation and fasteners because of their diligent and continual research in the application and durability of their products. 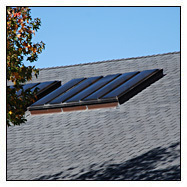 They offer a single source responsible product system that carries an interrelated warranty. 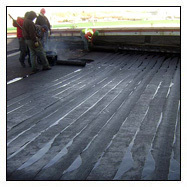 Modified Bitumen Roofing Membrane (aka MOD BIT) systems are similar in application to standard Built-Up Roofs by being set into hot or cold asphalts with underlying mechanically attached or adhered insulation board; however the MOB BIT Membranes should be viewed as SUPER FELTS. MOD BIT was born in Europe when modern felt fabrics like fiberglass and polyesters were first combined with Modified Asphalts in to create a superior product. The blending of tremendous tensile strength from these fabrics with high quality modified asphalts created the MOD BIT used today. These membranes have a proven track record for longevity with being able to withstand heavy foot traffic, ultra violet rays and the best of all, hail. APP Modified: In the early 1970's the Italians looking for a product that would convert asphalt flux into a useable more improved roofing product, discovered that if Atactic Polypropylene (APP) was added to the asphalt it gave the asphalt plastic properties. They found that by adding 30% APP modifier, they could stretch the modified asphalt up to 50% of its original length before it would break. This was a big discovery in the roofing industry and when APP modified asphalt was combined with polyester fabrics, also known for elongation properties, APP Modified Roof Membranes were born. APP membranes are applied using a torch, which gently heats and releases the solidified asphalt onto the base sheet. APP is often preferred by those with multiple smaller roofs because less over all material and equipment is needed. SBS Modified: SBS is a rubberized modifier that increases the overall performance of the MOD BIT Membrane. When southern Europe was focusing on APP, northern Europe was experimenting with SBS, also known as Styrene Butadiene Styrene. Adding 10% to 15% of SBS rubber to asphalt changed the characteristics and made the SBS asphalt stretch up to 6 times the its original length. Fiberglass and polyester fabrics are used individually in making SBS modified roof membranes depending on the performance requirement. The Super Felt has worked superbly for over 35 years. SBS membranes can be applied with hot or cold asphalt or torch applied. American Roofing highly recommends Firestone Building Products SBS roof membranes. We recommend their products because they are lightweight, have a reflective white surface, foot traffic and hail resistant and most important, time tested. American Roofing has installed hundreds of acres on dozens of schools, factories, apartment buildings, warehouses and museums. We stand behind Firestone Building Products because we complement each others commitment to high quality with decades of experience. 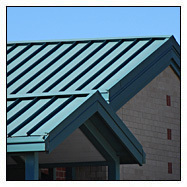 American Roofing has been specializing in sheet metal and metal roofing systems for over 30 years. 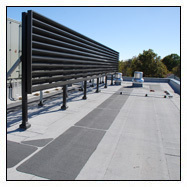 We have successfully completed every type of metal craftsmanship for commercial and residential roofing. With our state of the art metal break machine and decades of installation experience we can fabricate custom commercial, residential or industrial drainage systems to accommodate any drainage requirements, as well as order direct from a manufacture. Our workmanship is what will always separate us from other roofing companies. Installation is the key with residential roofing. Technology has brought nearly all shingles products to a relatively similar playing field; most all manufactures can create a viable 25, 30, 40, or even 50 year product. What's most important is the underlying felts and flashing and their proper application and installation. Perhaps an oversized gutter is what's best for your home, after analyzing the slope and square foot of your roof, a modified felt in the valley or behind your chimney, would a copper metal valley be best? We know how to water proof your home before a singe shingle is applied. We are the best at what we do. We specialize in custom work that requires master workmanship and decades of experience. We routinely install roofs for high net worth companies and individuals that have specialty needs, historic buildings or that have roofs that simply require high quality work. We have completed acres and acres of real rock slate roofs and the new technology rubber/plastic slate. Once again, we have done it all. We have carefully and methodically completed restoration work on centuries old slate tile at Fort Leavenworth, to a full installation of new or rubber/plastic slate on the Lawrence Airport. Start to finish, we have the expertise and experience to complete your goals. 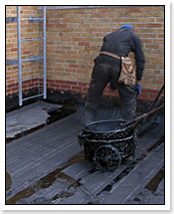 Proper maintenance of your commercial/flat roof is important because it helps to address small problems early and eliminate the risk of larger, more costly repairs later. Manufacturer warranties will require that annual maintenance is performed and American Roofing can work with you to design a plan that will help extend the life of your roof.